The city may be a concrete jungle, but as Mandy Murry pointed out, there is something special about New York. She described New York as “mysterious, lovely, and matter-of-fact all at once.” She even gave a shout-out to the New York Palace Hotel, which accommodated her during her stay. And that got us thinking about the places where you can stay in New York. 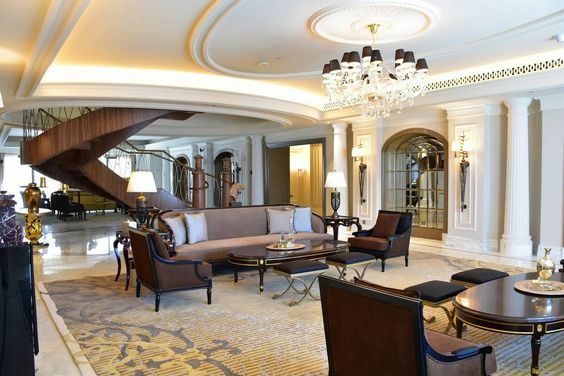 Specifically, we took a look at the most expensive hotels to put on your bucket list. In the Best Hotels Rankings by U.S. News, the Ritz is described as “beckoning to luxury-seekers in search of a prime midtown Manhattan location paired with impeccable customer service.” The price to stay at this particular hotel is exorbitant (obviously), with rooms starting at $995 and reaching $40,000 a night for the Royal Suite. But the excessive prices are worth every penny thanks to the Ritz’s location, unrivaled ambiance, elegant rooms, and accommodating staff. The Four Seasons is 52 stories of unparalleled extravagance. The ultra-chic TY Bar is a great place to unwind, while The Garden is perfect for those looking for a delightful fine dining experience. The cheapest rooms go for $945 a night, whereas the most expensive, the Ty Warner Penthouse Suite, can be had for $50,000, making it one of the most expensive suites in the U.S. Booking this suite has a major perk too: You get to travel in a chauffeured Rolls-Royce to explore the city. This super swanky hotel combines nostalgic decor with modern accouterments. Additionally, you’ll get to enjoy the French cuisine that is served at the upscale Mark Restaurant by Jean-Georges. Rooms at this first-rate hotel start at a slightly more reasonable $745 a night; the Penthouse Suite at The Mark, however, goes for a mind-boggling $75,000, which is one of the most expensive in the world. 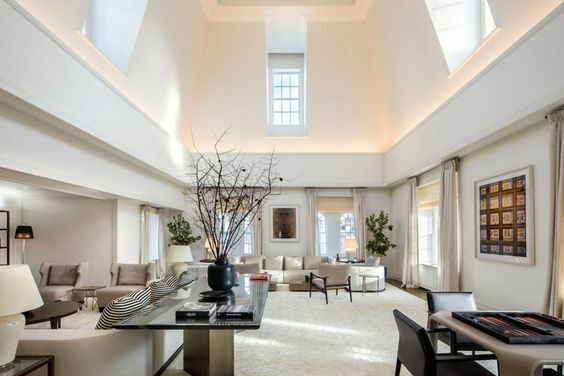 But with five bedrooms, a kitchen, six baths, a dining room, a living room, two powder rooms, and a 2,500 square-foot terrace, the price tag is almost justifiable. 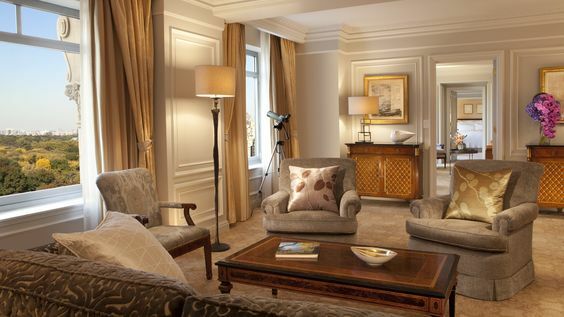 The Plaza boasts decadent accommodation complete with Beaux Art décor, elaborate floral motifs, marble bathrooms, and more. 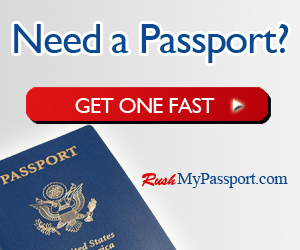 The service is world-class and the facilities, top of the line. Room at The Plaza range from $683 to $40,000, with the most expensive being the recently renovated Royal Suite, where a private chef can prepare the guests’ meals. The suite features three bedrooms, a library, a fitness room, and a living room with a grand piano. This Asian-inspired luxury hotel provides upscale accommodation complete with high-end amenities. It also features an eye-popping 14,500 square-foot spa that includes a lap pool. And let’s not forget the Asiate, an opulent fine dining restaurant that serves Asian-American cuisine. 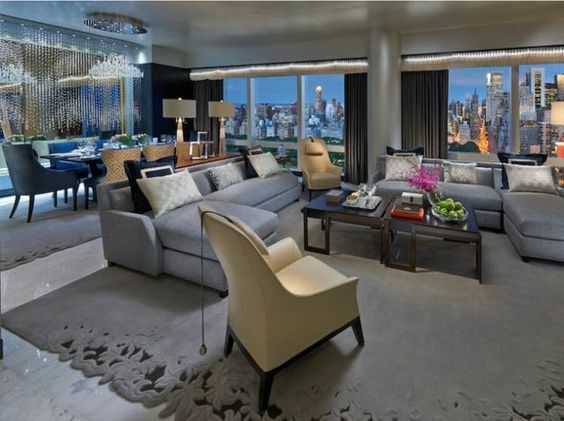 Room rates in the Mandarin Oriental go from $895 to $36,000 a night, with the most outrageous room of all being Suite 5000. Located at the 50th floor, this ornate living space features, among others, three bedrooms and a media center. It also gives guests a bird’s eye view of Central Park. Living in New York is the ultimate luxury, which is why the top suites in the above hotels are often booked out for long periods by the rich and famous. While the price of these rooms may seem extravagant, owning a property of a similar standard and location easily runs into the tens of millions of dollars. For those interested in doing so, Curbed New York actually has a list of these high-end properties. For a cool $110 million, for instance, you can buy The Pinnacle, a seven-floor penthouse at the top of the Woolworth Building. 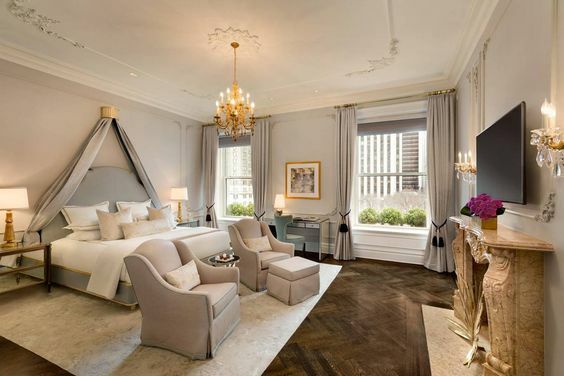 The Upper East Side mansion of billionaire Vincent Viola is on the market, too, for only $88 million. While those prices may seem high, even lesser properties are out of the price range of most homeowners. A Yoreevo feature on mansion tax in New York explains that a $1 million apartment in 1989 would now be priced at $2 million. And those prices don’t include the many property taxes the city has. This is why New York is one a place that many flock to visit, but less and less are staying in. With Christmas just around the corner, the time is now to grab a bite of the Big Apple. Book that trip, bring that checkbook and enjoy the finer things in life in the concrete jungle known as New York.